We saw the HP Z800 workstation a while back and now, we're checking out the Z600. its more affordable mainstream alternative. Tha'ts not to say that it is a less capable machine. The Z600 is smaller than the Z800 (at 32.4L and 14.4Kg) but it is still a substantial machine. 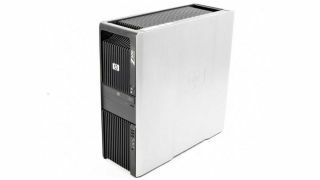 Launched early 2009, it was subsequently replaced by the Z620 in 2012, a unit with a similar looking case but significantly improved components. Speaking of chassis, the one that houses the components of the Z600 was designed by BMWDesignWorksUSA, which translates into a great looking case that integrates well with the other building blocks. It is tool-less, "visually cableless" easy to carry thanks to an integrated handset and made partly of aluminium, which translates into a cooler, quieter and gorgeous looking workstation. Pitched as a workstation that packs a lot of punch per unit volume, it does manage to cram an awful lot of performance, even though the parts are five years old already. The Intel 5520 chipset for example can power up to two Intel Xeon X5675 processors clocked at 3.06GHz with 6 cores, a 95W TDP and 12MB cache each. The system supports up to 48GB ECC RAM, that's six 8GB Registered DIMMS. The rest of the specification include HD Audio, a 650W PSU with 85% efficiency and a DVD drive as well as a bewildering array of options (solid state drives, RAID cards, NVIDIA or AMD graphics cards). Expansion capabilities extend to two PCI Express x16 Gen2 graphics PCI Express connectors, two PCI Express x8 slots (Gen2 and Gen1), two PCI connectors, six SATA connectors supporting RAID, 0, 1, 5 and 10, nine USB ports, Firewire, two internal 3.5in bays with acoustic dampening rail assemblies, two external 5.25in bays, two PS2 ports, one Gigabit LAN (powered by a Broadcom 5764 chip). Things have moved on since then with manufacturers pushing notebook components on the desktop. In addition, Apple's new Mac Pro has redefined the physical form factor of what is usually considered to be a workstation. Gone is the rectangular shaped chassis, replaced by a cylindrical shaped casing reminiscent of cigar shaped UFOs of the 1950s and 1960s.